I am beginning a series surrounding the “Fundamentals for a Better Game.” The aim of this is to provide ball flight and impact fundamentals any player regardless of skill level can use to become better. In Part 1 of this series we discuss Maximizing Distance. Previous Misconceptions? It was long thought the length of a drive was determined by the velocity of one’s swing accompanied with concernedness of strike. Although a higher club head speed is always welcome, it is only one of three factors to consider. 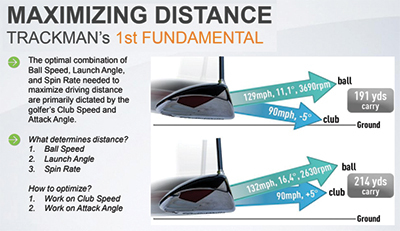 What does Maximizing Distance mean? There’s an ideal delivery for every player that will completely max out their carry distance. Looking for this delivery and pairing it with the correct launch data will give you the best shot at carrying the ball as far as possible. What Do I need to know? Really, two things. One of which is illustrated in the image. Hitting up at the golf ball instead of hitting down at the golf ball, will almost always result in a considerable difference in carry distance (assuming center contact). In our example, the difference in Attack Angle is 10 degrees (5 down vs 5 up) yet the carry distance approximately 25 yards farther! How Can I Practice This? This is one I commonly get asked. Practicing Attack Angle can be tricky. One thing I suggest is to at least be getting a TrackMan Lesson once a month to keep tabs on your numbers. Until then, to better your Attack Angle, you’ll want to focus on a visual I use. Picture the bottom of the swing arc as you’re looking down at the ball. From there, pick a spot 6 or so inches behind the ball and outside of your target line and put a tee in that spot. Now, begin hitting shots with the driver. Your focus will be to try and get the bottom of the swing arc to occur at the tee, so when the club strikes the ball it’s traveling upwards. It may feel weird and that’s okay. The goal is to make a positive change. Also, when working on this with players, it helps to feel as if the ball is forward in your stance and you are swinging out to right field on each shot. This will help the arc bottom out earlier, before the golf ball instead of later after the golf ball.